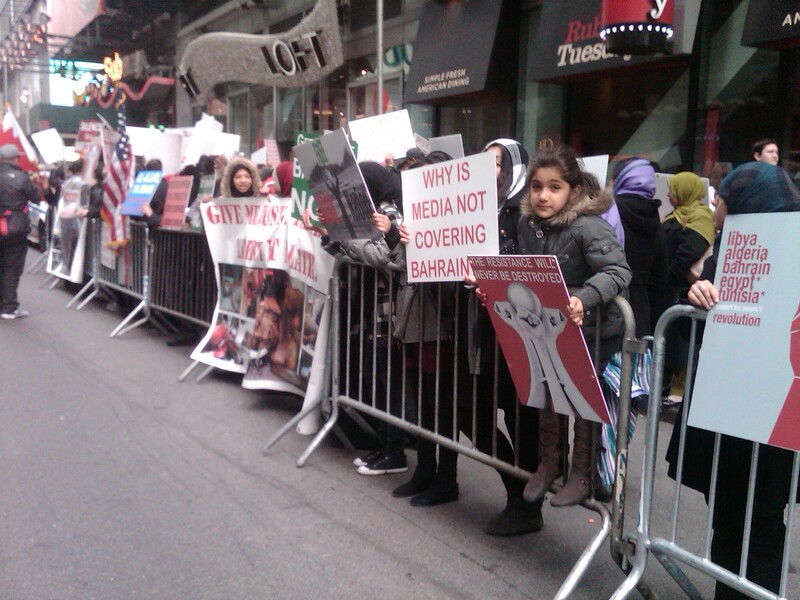 ← Bahrain protest called for April 22 in Times Square, New York City 3pm to 6pm. As of 5:pm today hundreds are protesting at 41st and Seventh Avenue in New York’s Times Square. Demanding respect for human rights and religious freedom in the Arab/Persian gulf state of Bahrain. The Bahraini people are facing occupation by Saudi Troops, a crackdown on their basic rights and descrimination against the majority Shia population. Several protests have been held around the world in solidarity with their struggle. A large protest was held in Washington DC one week ago today and another is scheduled for tomorrow. This entry was posted in Bahrain movement for a national democratic republic, Freedom of Worship, political mobilizations. Bookmark the permalink.